Both the 20-party opposition alliance and Jatiya Oikyafront, where the BNP is a major partner, are considering the launching of street agitation soon to press for the release of the BNP’s ailing chairperson Khaleda Zia and restoration of democracy, say sources. As part of the plan, the 20-party alliance wants to kickoff a new phase of movement with the formation of a human wall in the city and the staging of demonstrations at divisional headquarters, demanding the release of the former premier and what it describes as the restoration of democracy. After the warm up programme, the two alliances want to go for a bigger movement after the forthcoming Eid-ul-Fitr to press for the release of Khaleda Zia, who is serving a 17-year term in two graft cases, said the sources. The recent development in the BNP and its allies in the two alliances came following Sunday’s hunger strike of the BNP and Monday’s meeting of the 20-party alliance. Talking to The Independent, the 20-party leaders said they had already decided to soon launch a street agitation across the country under the banner of both the alliances and by the individual parties in the coalition. At one stage, they said, the alliance would take to the streets with a tough political action and strengthen the movement to reach its ultimate goal, hoping that the Jatiya Oikyafront would also launch a simultaneous programme based on a common agenda. Jatiya Oikyafront leaders, on the other hand, also spoke of the possibility of launching simultaneous political action along with the 20-party alliance on their seven point demands that include the release of all opposition leaders and activists, including the former premier. The leaders, however, said that they were yet to decide their new course of action, although the issue was discussed in various forums. BNP standing committee member Nazrul Islam Khan told The Independent that the 20-party had decided to launch a movement both under the banner of the alliance and those of the alliance partners. He expects that the Oikyafront would also begin a simultaneous programme in line with that of the 20-party alliance on a common agenda to free Khaleda, who is in jail for 14 months now and for the restoration of democracy in the country. Khan, also the chief coordinator of the 20-party alliance, further said they would make a call to the other political parties outside the two alliances to join the movement for the sake of country’s independence and restore the voting rights of the people. “New political course of action will be decided after discussing at party and alliance forums to implement our demands,” he added. BNP vice chairman Shamsuzzaman Dudu said there was no alternative to starting a movement to force the government to free the party chairperson and restore the voting rights of the people. “We have realized that the government won’t release our chairperson unless it was compelled to do so by a movement and our party and alliances will certainly chalk out the plan of action to in this regard,” he said. Executive president of Ganaforum Advocate Subrata Chowdhury said the demand for the release of Khaleda Zia was included in the seven-point charter of the Jatiya Oikyafront that was formed just ahead of the last national polls. “The demands still stand. Now we have to determine the course of action to fulfil it,” he said. Replying to a question, he said there was a possibility of adopting simultaneous programmes with the 20-party alliance on a common agenda. “We are yet to determine our course of action. Let us sit together to launch a field-level programme,” he added. General secretary of the Democratic League, Saifuddin Ahmed Moni, said the 20-party decided to go ahead with a field-level programme to press for Khaleda Zia’s release and the restoration of democracy. “Now, the alliance and its partners would adopt a programme of street agitation like the formation of human chains and the staging of demonstrations at divisional headquarters,” he said. 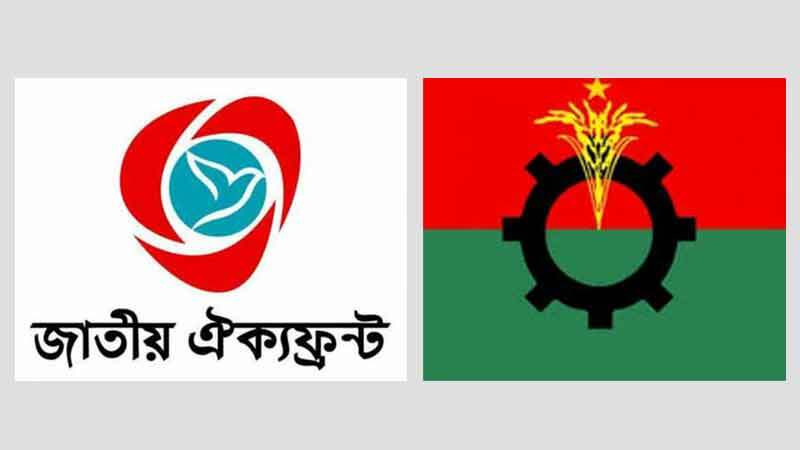 League, and its partners both in the 20-party alliance and Jatiya Oikyafront were upset with the results of the December 30 parliamentary elections, which they rejected over alleged vote rigging. The BNP and the Ganaforum, both partners of Jatiya Oikyafront, got only eight seats from among the 300 constituencies. But two lawmakers of Ganaforum, Sultan Muhammed Mansur and Mukabbir Khan, recently took oath and joined parliament, ignoring the party and Oikyafront decision. 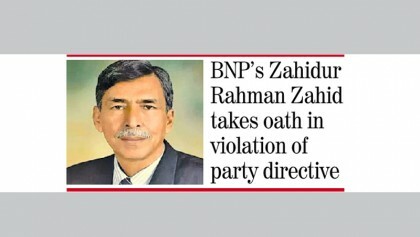 The BNP lawmakers-elect, however, said that they would not join parliament without the party’s consent, although the deadline to take oath will expire on April 30.